Believe it or not, that face represents everything you need to know about the managerial stylings of Joe Maddon…well almost everything. As a scientist in our day job, we reach our apex of nerddome every Tuesday when we rush to the newspaper stand to get our copy of the New York Times and their weekly “Science” section. 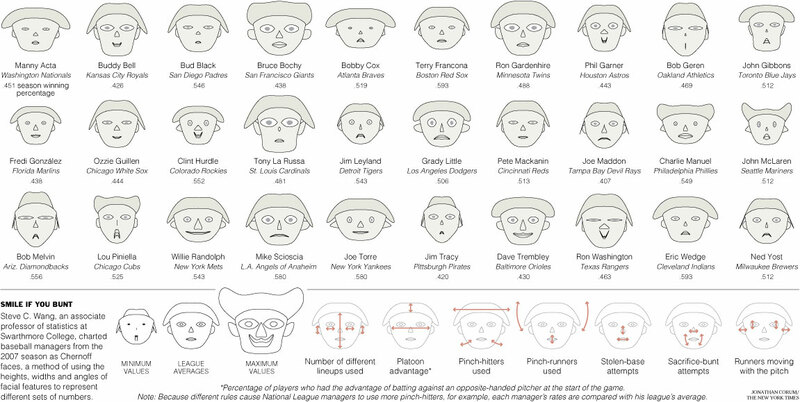 So color us surprised yesterday when we see that one of the feature stories in the Science Times is a story in which a researcher used Chernoff Faces to evaluate the managerial styles of every major league manager including Joe Maddon of the Tampa Bay Rays. Aside from won-lost records, few metrics quantify what these men actually do and the tendencies they exhibit. But an associate professor of statistics at Swarthmore College is trying to set that right, quite literally putting a face on managerial performance. The mathematician, Steve C. Wang, applied a method called Chernoff faces, in which data points in many dimensions are presented in a form that people react to more intuitively: the human face. Aside from the bizarre and humorous image of each managers style portrayed as a caricature, there are some really neat revelations that come to light once you orient yourself to what the different patterns represent. First off here are the keys..
As you can see various facial features are used to represent how one manager manages compared to the league average in several categories. A few things we can learn about Maddon. We can see that Maddon is fairly close to league averages for most categories based on the size of the face, hair, eyes and nose. The only two categories in which Papa Joe deviates significantly from league averages are the use of sacrifice bunts (he doesn’t) and the use of pinch-hitters (he rarely does). The latter may be explained by the amount of speed already inherent in the Rays starting lineup. And finally here is Maddon as compared to Mike Scioscia, under whom Maddon served as a bench coach. As you can see there are definitely some strong similarities in the styles of the two managers. The most telling differences is the more frequent usage of pinch-hitters by Scioscia (face width), the increased usage of different lineups and hit-and-runs (eye size) and the usage of strong platoon matchups (hair size). On the other hand, steal attempts, pinch-runners and sacrifice bunts are nearly identical. One feature we wish they would have included was glasses. Papa Joe’s would certainly be “rose-colored”. 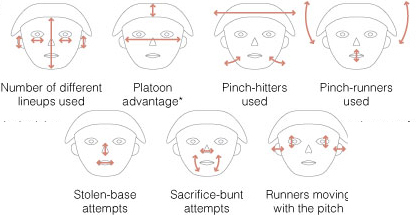 interesting that they would use sac bunts for smiling or frowning. you would think they would use something that is more clearly defined as something bad. for example using a million diff lineups is often a sign of a team that is experiencing a lot injuries. i think i had nightmares about these faces last night.